Is it too late to wish you Happy New Year? We'd like to apologise if it is but we've been making Nomique bigger and better than ever. If you're not excited already then you should be! Firstly we rcan't wait any longer to tell you all about what's been going on behind the scenes at Nomique, in regards to helping and guiding young people into the furniture industry. This week Nomique's Managing Director John Ravenhall and Marketing Assitant Isobel Coleman (recent graduate of UoW) went to The University of Wolverhampton to announce the winners of Nomique's Furniture Competition. Bright and early they entered the Art and Design building and headed up the lift with Robert Cooksey (leader of the competition module for Level 6) to go and meet all of the students for the first time. Each of the eight individual students that entered had to produce presentation boards of their finalised concept, as well as compiling all of their initial ideas, sketches, mood boards and costings. Their unique concepts had to keep to the competition brief, but also had to be inspiring, innovative and engaging for a chance to win. 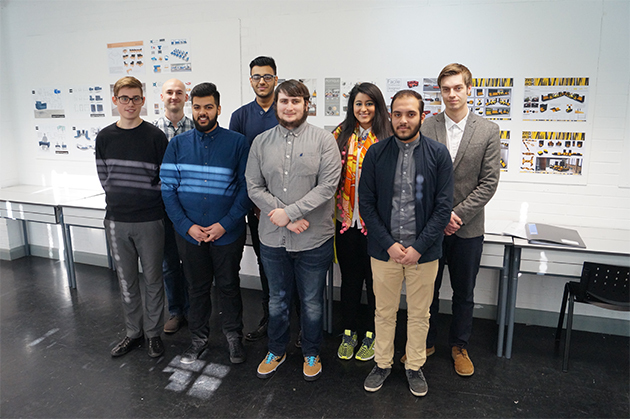 The brief stated that the student's needed to design a range of soft seating products for commercial environments. This range had to be modular in design and suitable for adaptable and versertile configurations to suit today's corporate, hospitality and educational environments. The students had to make sure that the range had many different base and additional options, including integrating modern technology. It was also important for the students to conduct relevant and indepth research into Nomique, their competitors and the industry as a whole, to find a suitable gap in the market for their product. John and Isobel were both incredibly impressed with the students work as well as their individual in person presentations. "All the students spoke clearly and with confidence. Having seen some of their second year work whilst I was studying it was fantastic to have the opportunity to see how much they have progressed within just one year!" Isobel exclaimed after watching all the students present their work to herself and John. The award giving was short but sweet, with a lot of tension in the room; after all the students had been waiting since the 16th December 2015 to find out who the winners were. With cash prizes for the top three entries and the chance to visit Nomique's showroom, factory and team for the first prize winner, it was well worth the effort and hard work that the students all put in. 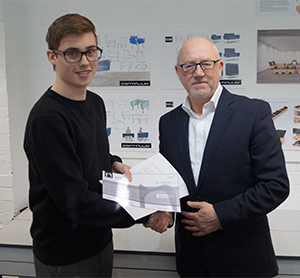 For Matthew Bowdler it was a dream come true as he took 1st Prize for his "Continuum" chair design. With it's sleek and stylish shape and chiselled legs, Continuum jumped off the page and caught John's eye immediately. The design was elegant and innovative, with different height backs and a sleek shape throughout. As well as this the desking solution for wheelchair users hit on a gap in the market that not even Nomique's larger competitors have tapped in to, many exciting ideas have come to light from this competition to make us excited about this new generation of designers. John especially liked the exciting concept of integrating a coffee machine between two booths! Nomique are looking forward to welcoming Matt soon at their showroom and factory in Telford, so he can further his knowledge of the furniture industry. Matthew's presentation boards for his "Continuum" chair design. However we must not forget the others who contributed to the winning selection, Matthew was followed closely by Joseph Tandy in 2nd Place, Zara Chander-Kumar in 3rd Place and Josh Gregory as Runner Up. It was a very close call and the decision was a hard one to make but John assured all the students that their work was well up to standard and the all of their effort was very well received. Joseph receiving the 2nd prize award and his modular furniture concept. Zara receiving the 3nd prize award and her "Zed Box" furniture range. Josh receiving his Runner Up letter of thanks and his "Contour" furniture range. There were smiles all round as the final photographs were taken and all the students seemed thrilled after being given the opportunity to meet a real furniture industry expert. Not only did the students enjoy themselves but everyone that took part at Nomique really enjoyed the process too and therefore can't wait to do it all again next academic year! So look out Wolverhampton University and Design Lecturers because Nomique will be back through your doors before you know it. We'll be back in two weeks time to tell you all about our up coming NEW Product Launch Events but until then if you would like to know more about Nomique's passion in guiding young people into the furniture industry then have a look at our previous blog all about the generation gap in the workplace and fresh young talent, including how it has benefitted Nomique over the years. Or if you would like to know more about Nomique then please follow the links below or get in touch.